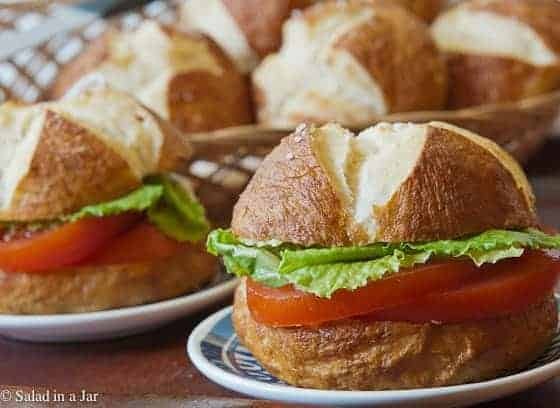 Make your own Bread Machine Pretzel Buns for a fun sandwich or eat them alone with a little mustard. Can also be made by hand or with a stand mixer. See instructions here. 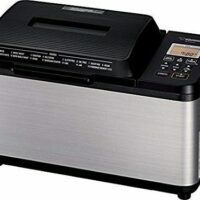 My bread machine has been getting a work-out lately. Have I mentioned my son, daughter-in-law and their two sons (4 years and 10 mos) are living with us just until they can find a house? Susie and I both like to bake bread and it’s much more fun with plenty of appreciative people around to eat it. I’ve been looking to add trendy pretzel buns to my repertoire so when I saw the original recipe for these buns on the King Arthur website, I downsized it and adapted it to the bread machine. I also did not care for the high, round buns they showed in the picture (too much bread in the middle bites), so I devised a way to make mine flatter–more like a traditional sandwich bun. Before placing the buns in boiling water, I flattened each bun with my hand. You can see a difference in the shape in the picture below. Because these are chewy like a pretzel, I would suggest a sturdy filling, like a hamburger or a chicken breast. Chicken salad or other gooey concoctions tend to squish out all over the place when you take a bite. At least that’s my experience. On the other hand, my husband likes to eat the buns best with no filling. He only needs a little mustard. Flatten buns after resting period but before boiling for a flatter more sandwich-like appearance. Just in case you need a tutorial for how to make nice round balls, check out the video below. Make your own pretzel buns for a fun sandwich or eat them alone with a little mustard. Add all ingredients except coarse salt to bread machine in order given. Select dough cycle. Open lid and check dough after a few minutes. It should be a slightly sticky ball. When dough cycle completes (bread dough will rise inside machine during this cycle), remove dough from pan to a floured surface. Preheat conventional oven to 400 degrees F.
Divide dough into 8 portions and make into balls. Allow to rest for 15 minutes. Meanwhile, prepare water bath. Add soda and salt to water and bring to a boil. Gently smash each ball into a flat bun-like shape. Drop each bun into your boiling water bath. Cook 30 seconds, then flip and cook another 30 seconds. They will be wrinkly as a raisin. Remove each bun to a well-greased cookie sheet or a tray covered with a silicone mat. These buns are prone to major "stickage." 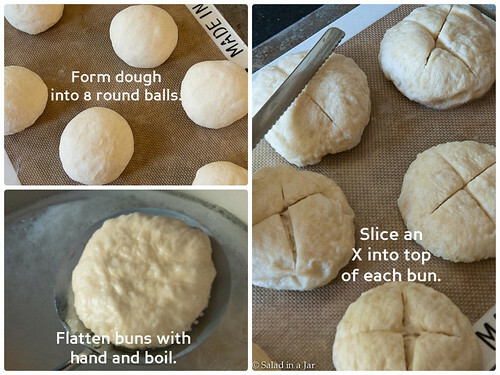 Use a serrated knife or new single-edge razor blade to slice an X into each bun about 1/2 inch deep. Sprinkle with coarse salt. Remove buns ASAP to a cooling rack. Otherwise, they will stick. When cool, slice horizontally if using for sandwiches. Thanks for writing. You can use the amounts specified in your machine. No worries. These buns are delicious. Hope you like them. I am going to try this recipe tonight. About how big is the diameter after cooked? I want to use them for burger buns. I’ve made these and they are wonderful! I just made those. I have to say they have no taste. Very plain. Nice and crispy but no flavour. Next time I have to add sugar and salt in the dough. Paula…omg thank you thank you thank you. These were awesome. I didn’t have any dry milk so I used 2 T of original coffee creamer instead and they turned out wonderfully. I sprayed the hades out of my cookie sheet with pam and I took them off immediately and they just came right off. They were perfect. My family loved them. I have been trying to wean them off of HFCS and now I have eliminated three more things out of my fams menu with this recipe. I am going to use this recipe for individual pretzel pizzas! omg so good. Love hearing the success stories. Thanks for writing. I made these last night to go with beer cheese soup, they were so good!. I think next time I’ll make 4 or 5 and use them as bread bowls. My kids enjoyed them so much that we didn’t have any leftover. I baked them on a cookie sheet, covered with sprayed parchment. Didn’t stick at all. Looks like it worked! Delicious! Thanks for posting! I can’t see the picture but I’m so glad you liked them. Trying this right now. I went to buy nonfat dry milk, and has a choice between instant and non-instant. I chose the instant.. Hope it was the right choice.. I haven’t used this ingredient before.. Working on these now. Hope they come out well. I only need 4 so gonna use the remainder of dough to make regular pretzels and see how that comes out. After you make these how should they be stored and how long will they stay fresh. Thank you. do yo think whole wheat four will work? I have not experimented with whole wheat in this recipe. However, I would recommend that you start by only substituting one cup of whole wheat for white and see what happens. Don’t expect your buns to be as light as they would be with the original recipe. Whole wheat requires some different handling and I recommend it only for the more advanced bread baker. I would also recommend you look for a recipe specifically designed for whole wheat flour. Good luck and thanks for asking. Love this recipe. Make it once a week it seems. Kids no longer like the pretzel rolls from the store. Only these. Thanks!! Does your recipe for Bread Machine Pretzel Buns, not require sugar??? These look fabulous! They are on the menu for tomorrow night only I’m going to make hot dog buns out of them. Can’t wait! What a lovely sandwich these pretzel buns make! I bet they are delicious just by themselves though too. I made these this afternoon — delicious! Hi Paula, thanks for another yummy recipe. I made your yogurt last night and it is getting so much easier. I can not bring myself to buy yogurt now. Thanks so much and I hope you have a great week. Try to stay cool. Do you think I could shape and use this for pretzels also? This would be a perfect recipe if so. Thank you. By the way the buns look fabulous! You bet! A little more trouble to shape them but also delicious. In step 8, do you bake them on a Silpat-lined tray? Thanks! Yes. Or a very well greased cookie sheet. I always use the Silpat myself. Mmmmm, I have GOT to try this! I have been eating low carb but will make an exception for these.